Bonnie Hunter published step 7 this morning of Roll Roll, Cotton Boll. I so wanted to work on this today but alas, I had to go to work. (And that is another story!) But I did manage to construct one block this evening. 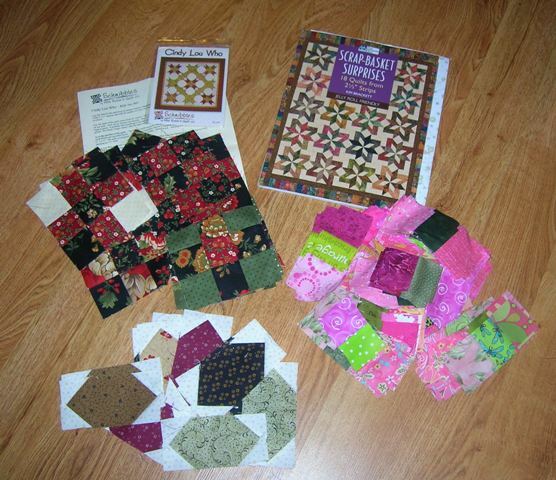 My plan is to do some serious sewing on this project as well as the Thimbles swap quilt. I have made 24 blocks on that one and need to start putting it together. I need to make progress on these two projects because soon I will be dealing with Comfort and Joy.....what was I thinking. I sure hope my support group is out there waiting for me. If it weren't so dang pretty, I would not do it it but I luv, luv, luv it. I am not sure what Wild Willie is thinking about in this picture. He looks like he is a bit annoyed. But he has been fed and watered, his toys are all over the place. 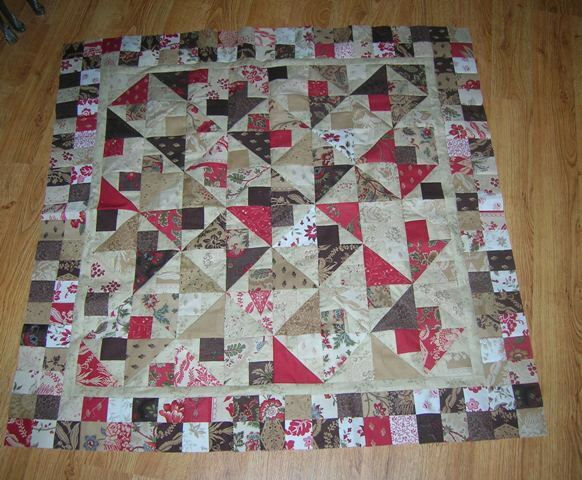 To all my friends in blogland, I hope you have a very happy new year and all your quilty dreams come true! 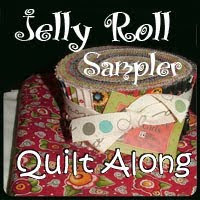 Looking forward to 2 quilt retreats-one in Feb and the other in August. Also pretty excited about the cruise on the big boat! Cranking out the sections for the half square triangle units..ended up with 598 instead of 600. But after a quick fix, I have completed this part of the mystery ahead of Friday!!! 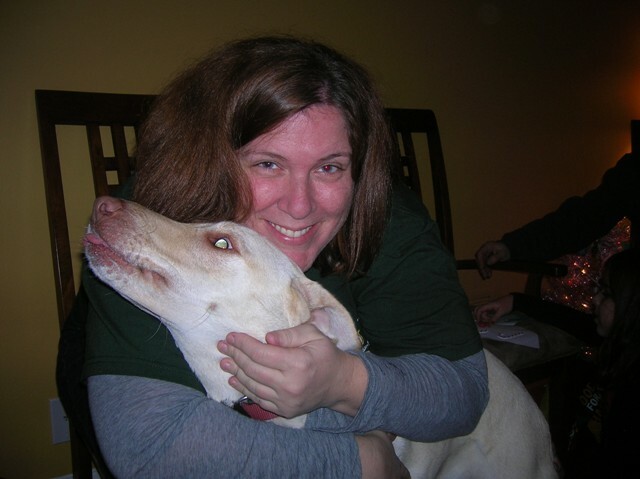 Her is Laurie with Lainey no brainey! Tyler and Alice getting ready for presents and Santa! Christmas Day we were back at the Frieds for more festivities and more food. Snow started in the afternoon and I headed home while it was still light. Today it is cold and I am playing with RRCB. Lots of blocks still need to be put together in step 6. It is almost here...and I am just about ready! Tomorrow is the cooking-Swedish coffee cake and Swedish meatballs. 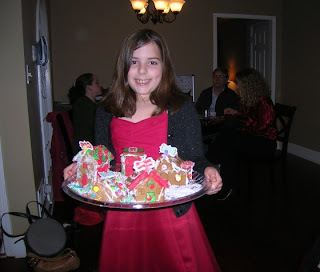 Tradition for me since I was a little girl. My mother would do every Christmas Eve. She would gather the ingredients, mix and let the dough rise. She would put the bowl on top of the radiator. I haven't seen an old radiator in many a year. I have to struggle to find a warm place for my dough to rise. This year I will be baking and cooking with Laur. One of the girls better know how to do this-I won't be around forever! I have to wrap a couple of gifts but I need tape. Tomorrow that will happen. Here in the Atl, there is a chance of Christmas snow. Not too exciting for me as I really HATE snow but it would be a treat for the kids. 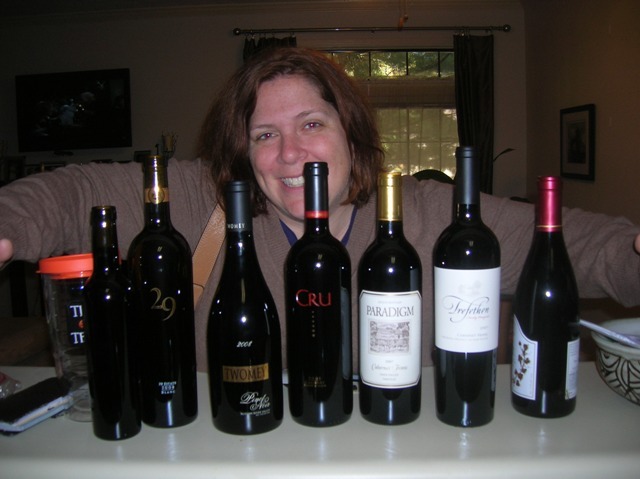 Laurie's B & B is open so I am good to go!! 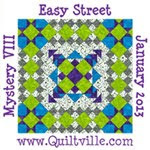 I have finished Step 5 of RRCB mystery quilt. 600 half square triangles. They went together much faster than I thought they would. It took me longer to get step 3 done. Tomorrow the next step is published. I can not figure out what the pattern will be yet. Maybe tomorrow it will be a little clearer. 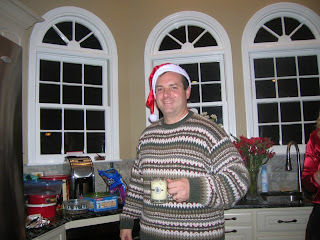 So to all my blogging buddies and all my friends, near and far....MERRY CHRISTMAS!!!! 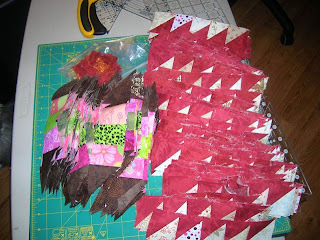 Roll,roll, cotton boll-step 5: make 600 half square triangle from reds and neutrals. Last Friday this sort of overwhelmed me but I decided to approach it one bite at a time. I've been working at it in the evening...go figure I'm awake! since the red fabbie I am using is trimmings from a backing, my lengths are not the same. 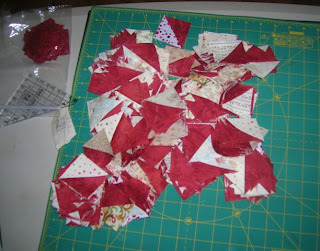 I've finished the step 3 blocks-the paper pieced string blocks as well. I might even be ready when the next step is published! I still can't figure out the design-where does that step one fit in? I wonder how many more steps are still ahead. Must hit Publix today (old people discount day) to get the stuff for my next venture into the kitchen Christmas Eve. Laur says I am the only one who can make the Swedish coffeecake since I have the big bowl. This from the one who makes pots that are fabo. I gave all 3 of the girls the recipe last year. Sure hope the tradition does not die when I do! And on that thought, I will go have some coffee! I was so excited to snap a picture of my completed step 3 on the Bonnie Hunter mystery. But the camera is out of juice. I will take a picture after I get some fresh batteries. It has been a good weekend. It always is when the Thimble gang is involved. We had our bring a thing in a thing day and ate some pretty great food. 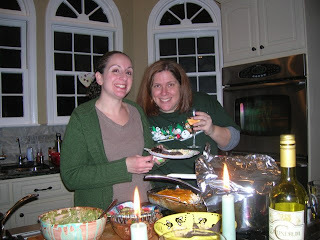 As Gretch says-no friut or veggies were present! We were all working on different projects this month. 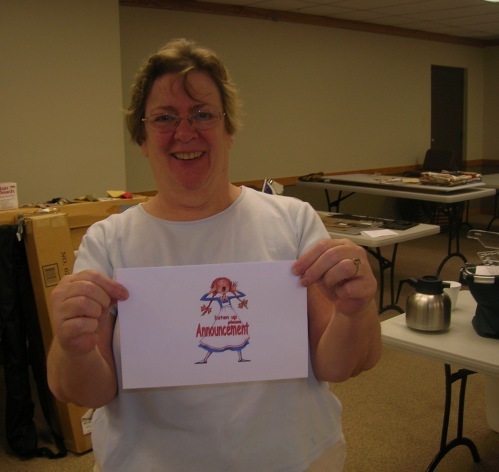 Gretch was working on Bonnie mystery. 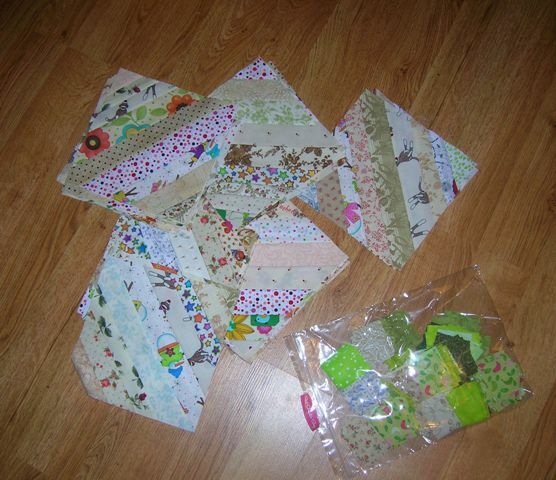 Kristi worked on our swap project and shorted herself 2 little squares..not bad because she did cut 846 of them. Cindi worked on an old project called plaid goose. As I recall-I finished one block on that and now haven't got a clue what happened to the rest of it. Somewhere in the sewing room? Becky was working on scrappy nines. We were all quite productive! I am seeking members for my support group. Next month begins comfort and joy(?) I probably will rename this baby after it is completed I asked Pat if I could use a glue gun or maybe staples on all that durned applique. Today I ventured into Laurie's kitchen to make her birthday breakfast..french toast and bacon. Kris and Alice joined us. And it is not officially winter yet. We have been dealing with unseasonably cold weather for the ATL for many days now-seems like forever. And now we have sleet and ice. While Northerners can deal with this, here in the South not so much. Would you believe the city of Atlanta has 8 salt trucks. I have to go to work this morning but I am waiting until it is light so I can see the ice! Probably not as cold as it is in the north but way too cold for me. Flurries all day yesterday and I guess this morning and temps in the teens right now. After delivering Sarah and Emma to the Christmas pageant, meeting Laurie for breakfast and picking up my new Kindle (!!!!!!!!) I headed home to the couch and hibernated the rest of the day and evening. My garage door opener died on Saturday so I need to get that replaced. Will have to see about that today (if the state doesn't come). Didn't do much sewing this weekend. In fact, didn't do much of anything this weekend. Bonnie published the next step today. I have not finished part 3 yet! That step is 60 of those suckers on the top. So far, I have 29. My dilemma..finish step 3 or do step 4. 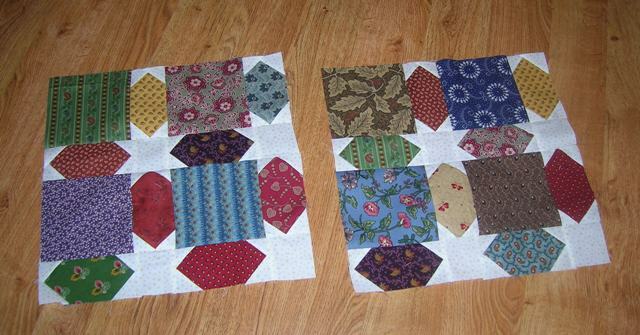 The committee decided that I should proceed to the next step and then work more on the strip blocks. And now I have another week to finish the other 31 blocks! Heading out to Bad Melisa tomorrow with Cindi and Becky to check out the happenings. And then Sarah and Emma are coming over for a sleepover. I think I am in deep trouble as Christmas is approaching but there is hardly a sign of it in my house...no tree, no outside stuff, no nothing. Just not in the mood to drag all the stuff out (and then have to put it away again in a couple of weeks). I was scolded by Sue because I said I didn't think I would do Christmas cards either. Just call me Ms. Scrooge! I noticed on the yahoo group there are already posted pictures of this step. And m y friends Cindi and Gretch call me an overachiever? I actually now have 6 made!! My goal for this weekend is to have 15 done. Only time will tell on that one. This morning bright and early, we headed out to Sweet Home for Groovy Girls. Yeah..no applique this month. I was bad. But it is partly Sarah-no blog's fault. She picks out things that I need to have. She did show me one item-a mini portable Ott light. Unfortunately, I need to get batteries for it but I sure could use it this evening. I also got a few zippers for the project demo today and a few pieces of fabric. Then I headed home to wait for the Direct TV man to come. I bought myself a new tv last week because the old one was doing funky things. Turns out, it wasn't the tv but the cable box was going bad. At any rate three and a half hours later, he was on his way. He had more roof time than Santa Claus. I had planned to hit Publix when he left but by then it was late and cold and I wanted only to sit on the couch under a quilt. Sewing binding on the retreat quilt while I watch the Hallmark channel movies. I lead quite the crazy life...not. This week at work was, in a word, horrible. It just went on and on. I felt like I was on a treadmill. All I want is to be able to keep up and it just isn't happening with the new assessment process. But now it is the weekend and I don't plan on thinking about that place until Monday morning. Last night we won't even discuss what I ate for "supper". Let's just say....well nothing! I decided to get the laundry done last night instead of doing it today. Bonnie's next step arrived this morning. I knew easy had to end and it did. This step is not hard but first I had to make 8.5 inch paper squares to do foundation piecing. Done. I had thought about another project some time ago and had printed on some Carol Doak paper. Reused for the squares. Also worked a little on the Thimble swap. Today is Groovy Girls....please Melisa......NO APPLIQUE. I will report back later. 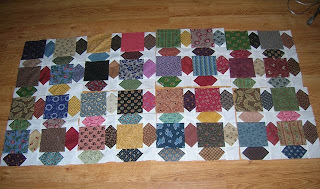 I am so excited-I have finished 8 of the blocks for the swap we did earl er in the Fall. I have not finished sewing all of the teeny pieces yet-I think there are still 100+ of those bad boys. I really do love scrappy quilts and this one is no exception. I wanted to do more last night but Henry made me sit on the couch to keep him warm! Groovy girls in 2 days...yipee. Hope there is no applique involved! Need to make a binding for the X Block quilt and I'm not sure if I already have the fabric for it. I had to work yesterday, so I decided driving to Sweet Home before dawn was probably not a good idea. But I did cut work a little short and headed down there later in the afternoon. (Not that I needed anything!) But that never seems to stop me. I only bought one piece of fabric, a little kit and something that I whipped up for a Christmas present today. And then I headed home. 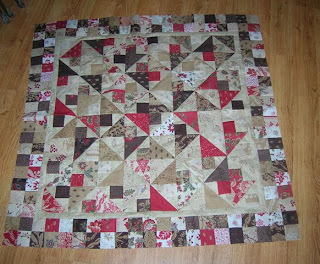 Today I finished Part 2 of the Bonnie Hunter mystery-120 brown/pink half square triangles. And then I went back to the 34 billion one and a half inch squares. I think those little suckers are multiplying in the bag. 848 squares=4 squares to a block=212 sections. I have made 103 so far!! I finished the table runner for Kris at least And then I made it to the couch. THE END. And now it is midnight and I am wide awake..well maybe not "wide" but I am awake. So I think I will move into the bed. Henry is waiting to get under the covers! I am one very lucky person. I got to enjoy my whole family today. We celebrated turkey day at Sue's house. Sarah, affectionately known as the Decoration Natzi has been hard at work on the decor all week. 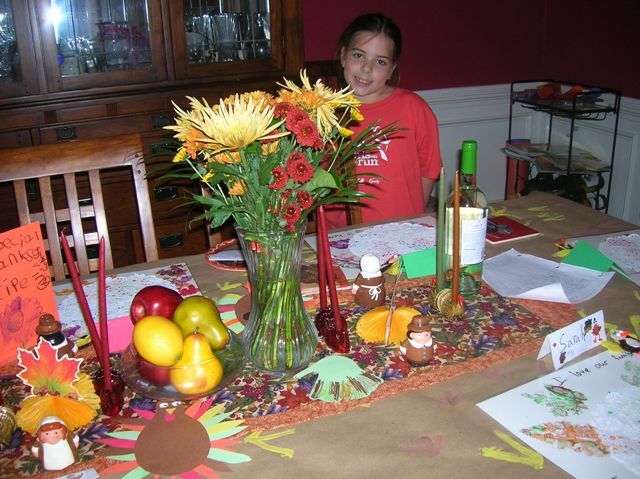 She really gets into decorating the table as you can see. Place mats, doilies, name cards, the whole nine yards. Rob did the turkey, Sue the sides, Laurie brought her broccoli puff. (I brought the gravy). 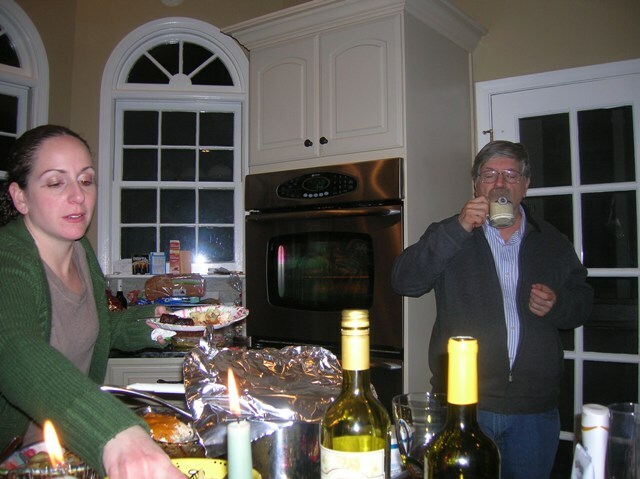 Poor Rob made traditional gravy as well. Sarah tried both but I think William Sanoma won. (love their turkey gravy base). Kris and Alice joined us for dessert. An unplanned bonus. Tyler has to work at dark thirty tomorrow morning, so he was home napping. It was a wonderful meal. I am stuffed and don't have to eat for weeks..or at least tomorrow. I so look forward to getting together with the Thimbles gang. Only downside is that it only happens once a month. And now it will be almost Christmas when we meet again. This month's project is from the book Scrap-Basket Surprises by Kim Brackett and is called Bali Sea Star. 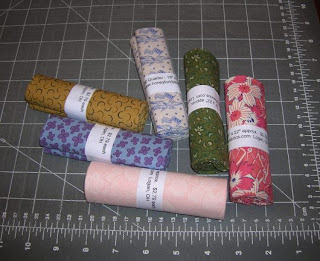 The fabric line is Whittier Crossing from our own Mary Ann at Little Quilts. It is yummy. 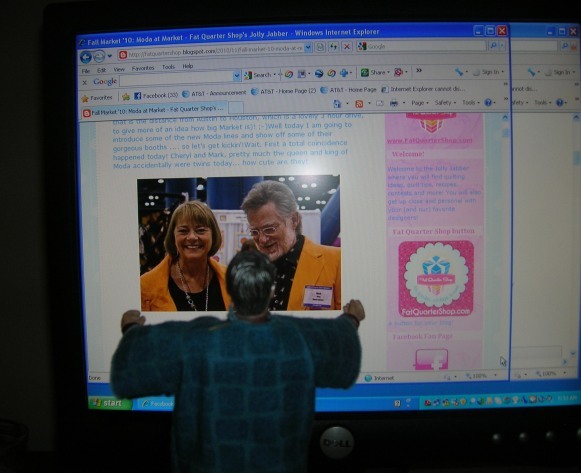 Gretch has a picture of it on her blog. My fabric is still in the bag. This book has several other projects that are on my to do list. But first I have to finish some of the stuff I have already got in the works. So what have I accomplished this weekend? I have to get busy on that one as I have heard that Gretch has picked out our next one. I also gave Thimble Queen Pat palpitations when I informed her I am signing up for Comfort and Joy her new pattern. 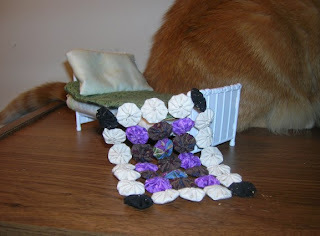 It is being offered as a block of the month by Bad Melisa. 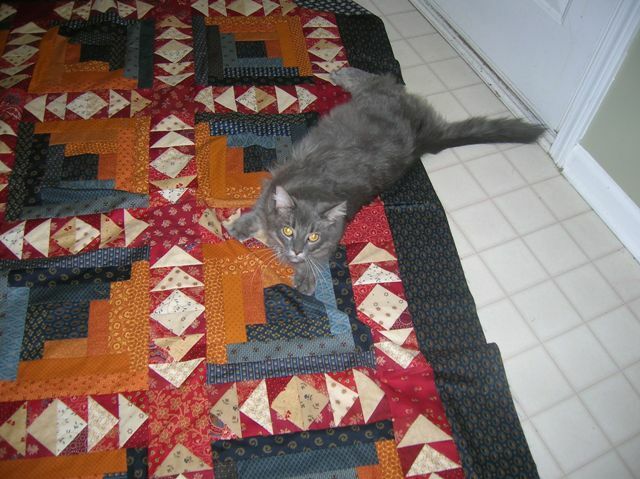 I did warn her that she would be subject to my whining do to all of the "A-word" that this quilt involves. It is an 8 month project. And every month has a component of applique to be done. I will either survive or become a raving maniac by completion date! 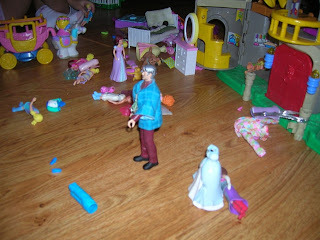 Moda Man, Polly Pockets and dragons..
Moda Man was in the thick of things as well-entertaining the Polly Pocket girls. 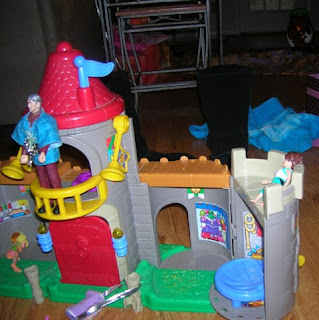 He played in the castle. I wonder if Marc Dunn has a carriage? I know he does not have dragons like Moda Man. I need to get the girls some breakfast and take them to church. Then some more sewing to do. 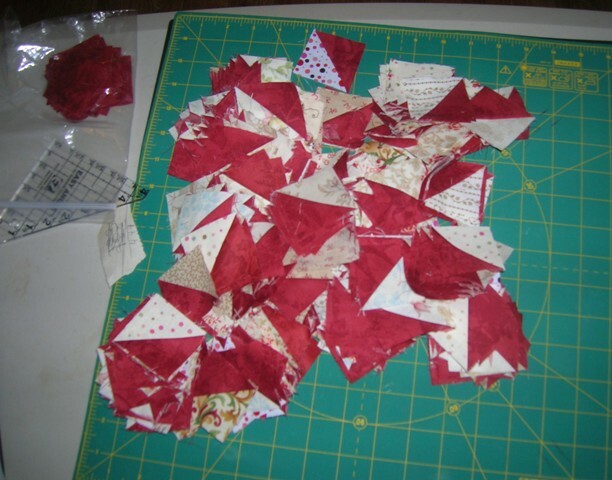 Well actually I had already started it-cut out all those little one and a half inch squares. I decided I would play with it in the hotel last evening. 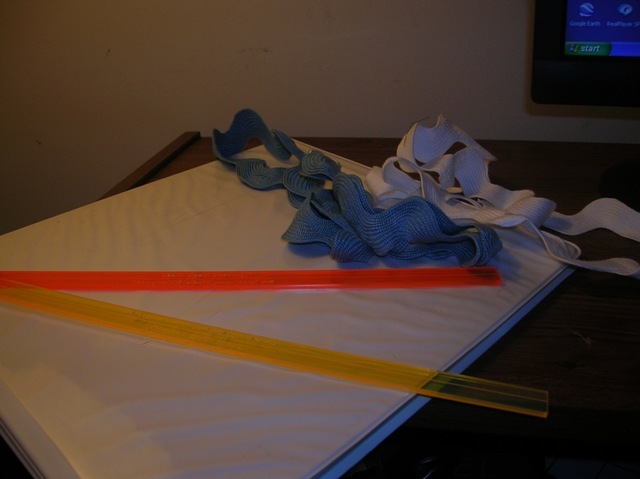 I figured I would need to fondle some fabric after a day at the home office. I had it all planned and took my little box of stuff with me, plus a little mat and my rotary cutter. I forgot the ruler. BUT I improvised with the directory in the room. Okay-so now it is not quite the way it was before I began-it now has a few raggedy edges. Please don't tell! When I got home this afternoon-thankfully we got out early and I was able to drive down 85 in daylight, I made 2 blocks. I think I have 22 more to go. I have to check with the girls to see what size we are making as I can not remember. Yet another senior moment!! So looking forward to Thimbles tomorrow. I wish I could go tonight as well but I am just too tired. all I really want to do is put on my jammiies, get on the couch with the guys and under a quilt! I don't seem to be able to get any sewing/play time in during the week. Just too tired after toiling at "the home". I try to use the weekends to accomplish stuff. I made a list on Friday but promptly lost it. I don't remember what I had planned. 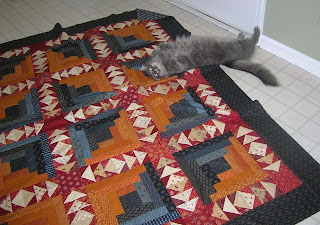 I finally finished constructing the back for the Twister quilt using the schnibble as a center. I had planned on using a lighter fabric to surround it but ended up with the yummylicious chocolate brown print. I also finished up a "10 minute" table runner. I have yet to make one of these bad boys in 10 minutes. And I got caught up on the BOM from the Quilt Room. 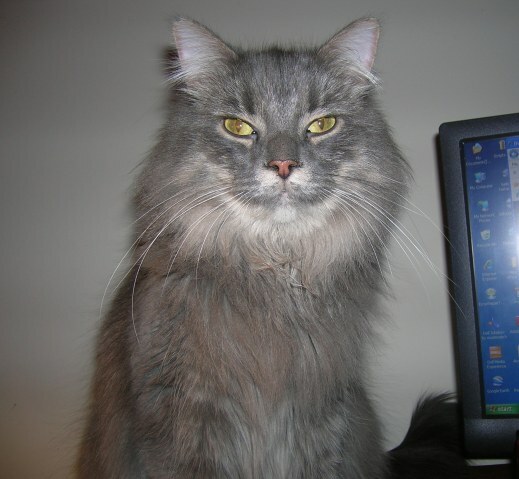 Henry is insisting on sitting on my lap right now. He keeps looking up and I swear he is thinking "when is she moving over to the couch." I think he is feeling chilly today. I put the flannel sheets on the bed yesterday and last night he was in his usual under the covers position. Need to go find another project-I have some Dr. Seuss fabric for pillowcases for the little girls. Postscript to yesterday's blog down memory lane.. But I say to her-go fly up to NY and see the darn tree. I would like to see it but I no longer go north after the middle of September. I'm cold down here now and I can't imagine dealing with cold in Mahopac! By the way Mahopac is an Indian name but I can't remember which tribe lived in the area. There was a joke that it was named after someone boating on the lake who was having a cigarette and said my-ho-pac fell in the lake. Dumb!! When checking facebook last evening, Kris mentioned that the big tree at Rockefeller Center is from our hometown this year. Go Mahopac, New York. Yes I live in Ga now but deep down I am still a New Yorker and proud of it!! It got me to thinking about Christmas when I was much, much younger. I remember going into the "city" with my Mom. We would take the train-NY Central line, now part of Metro North. It was a treat. I remember a little apprehension when the train entered the tunnel in northern Manhattan and looking out the window and not being able to see a thing. And then, getting onto the platform and walking into Grand Central Station. It was awesome to a little kid. We would walk over to Macy's Herald Square and see Santa and then walk around and see the store windows all animated and decorated. I remember going into the big dime store-Woolworth's. It seemed huge at the time. Good memories. Then when I was in nursing school in Manhattan, I remember going to watch them light up the tree. You couldn't really get close to the entertainment but you could hear it and then they lit the tree!! Somethings you never forget. 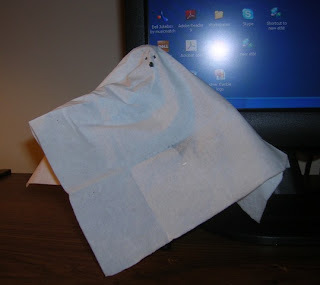 Just sayin' that things are different these days-decorations up and ready to go at Halloween. Some how it loses something when you start so early. 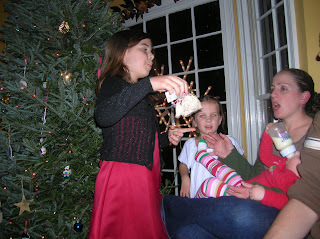 At any rate, I am anxiously awaiting the 2010 tree. The family that donated the tree this year has a story as well. He is a NYC firefighter. Their tree was selected on 9-11 this year. The boys in assigned spots-relaxing for some early evening tv! I did get my card punched for last month's project and now I can send Kathy her bag. Heinous applique first and now I need to be thinking kitchen? What is wrong with this picture?? This month's project was napkins. Now I don't buy paper napkins anymore. They come with the take out I buy. Or I can use a paper towel if need be. So here I am making napkins..and then practicing fancy folds!! I have managed to make one. Also I did finish the 10 minute table runner for which I bought the same fabric twice! The first one I made took slightly more than minutes..well more than slightly. Now I am ready for my next punch. What's next, Melisa?? 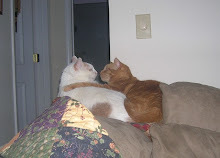 Wild Willie and Henry keeping up with the blogging world. 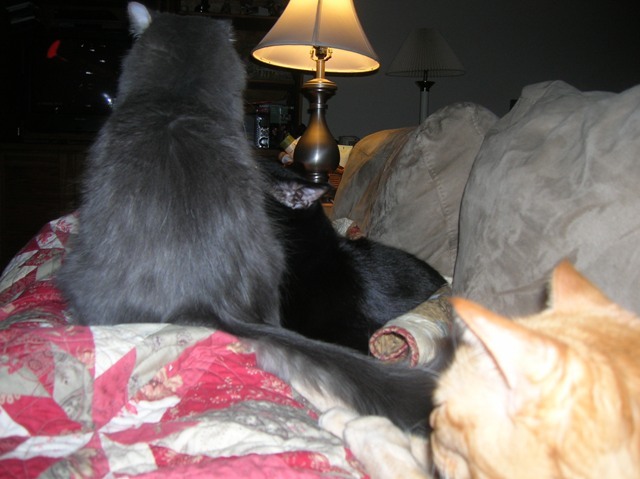 They are especially interested when I tell them that Stella and the boys are in the news. 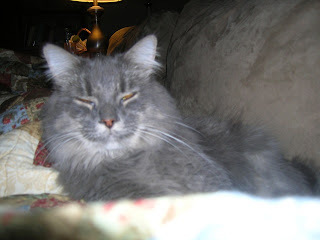 Henry is waiting for me to settle down on the couch, so he can get comfortable. Not to be left out of the evening activities, Spooky joined in on the inspection process. 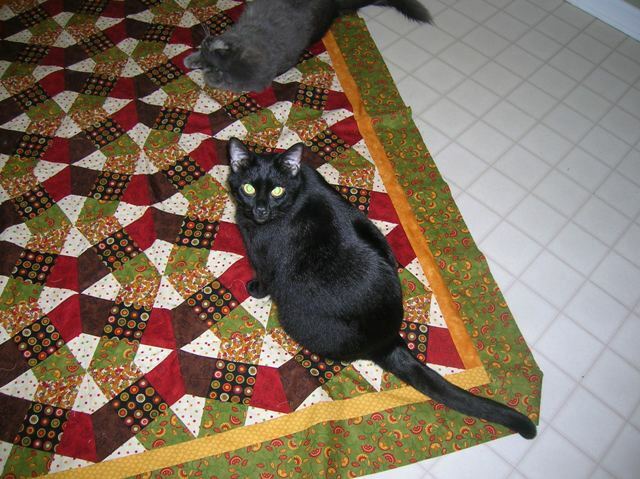 Shortly after this picture was taken, an altercation happened and currently the quilt top is in a wad! I must go rescue it before any damage is done! Oh that Moda Man-always in the know! 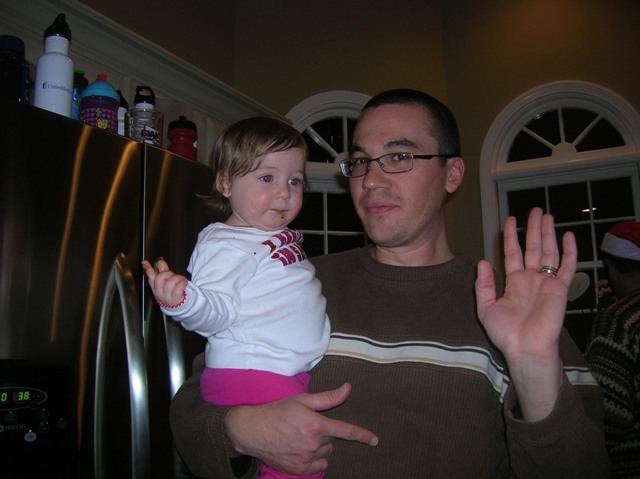 Kind of a random blog. While I am not fond of Halloween per se, it does signify the beginning of the grand holiday season. Hopefully after Tuesday, we will not have to deal with any more political ads and generalized mud slinging. In Georgia, we seem to have a poor choice but just which one is the lesser of two evils? 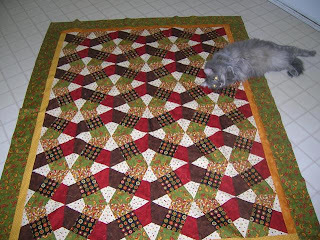 At any rate, Homeward Bound is finished and ready to be quilted. Wild Willie inspected and gave his paw of approval. Not the most dignified of cats! Laurie went to Napa last weekend and brought back some treats. These will not be shared tonight-especially #2 on the left! I hope she hides this one from Lilly! And just one more thing...I need to defend my cooking skills. One of my children has made it known in Facebook land that my chocolate chip cookies are like hockey pucks. This was reported after her cousin mentioned them in his column today (Idyll Banter in the Burlington VT paper). I have to admit, I have lost my touch with cookies BUT I can really make a fabo pot roast and the Sweidsh coffee bread at Christmas is long gone before it is stale! So there!!!!!! ..at least some of us are! I am not fond of Halloween as it is today. I remember the good old days when it was just an innocent time-no safety issues and you stopped going out when you hit age 12. When we lived in NY we lived in a contained development and people would literally drop their kids off to trick or treat. I didn't mind handing out candy to neighbors, it was the others that made me nuts. Now I just turn off all the lights and watch TV in the back of the house. On the other hand, Moda Man is preparing for his night out. I told him he had to make his own darn costume, so this is what he created. I wonder what Fat Quarter is going to be?? 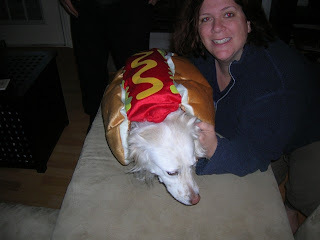 So glad it is the weekend...even if it is Halloween! 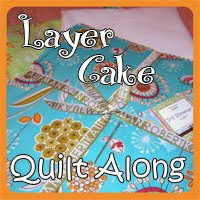 I used to say that..then I won the grand prize at quilt camp in September. I won a gift card at a drawing at work and then about a week ago, I won on line. Yesterday my prize came. Six pretty fat quarters from Honey Fork Fabrics.. Thank you Ellen Edwards for my treat! Gotta keep Bad Melisa happy.. I was out early yesterday morning to be at Sweet Home when it opened. Bad Melisa's having a sale. Word was out in Thimble land so I was not surprised to see lots of Thimbles ready-checkbooks in hand! I got a great deal on a piece of fabric that will someday be a backing-five yards of Glace! 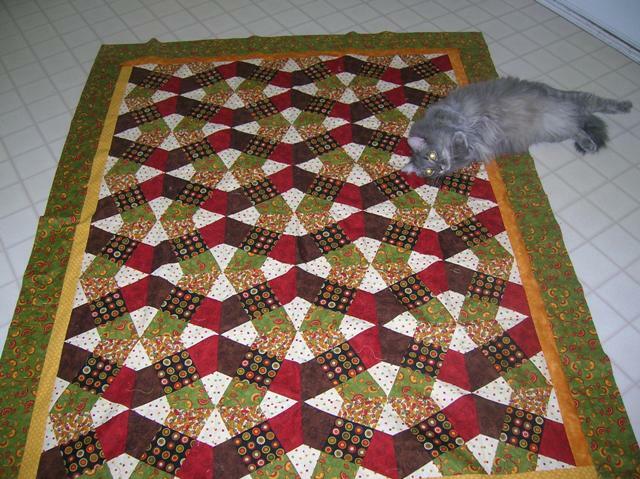 Also bought a sample quilt. Wonder if I can claim it as my own? Not to worry-I won't. A kit (with dare I say some applique in it) and a little fabric book that ended up in Alice's birthday bag. I did not buy Moda Man's tree although several of my friends said I should! And I visited with Becky, Kristie, Gretch-the birthday girl and Sarah no blog. They all had cameras with them and hopefully there will be a picture of the event on someones blog. Then a stop at Stbx for a little more socializing. 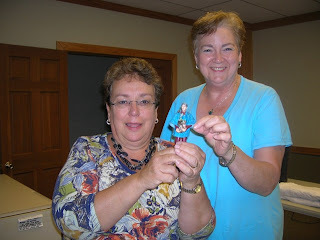 I heart my Thimble friends! Now for a relaxing Sunday! 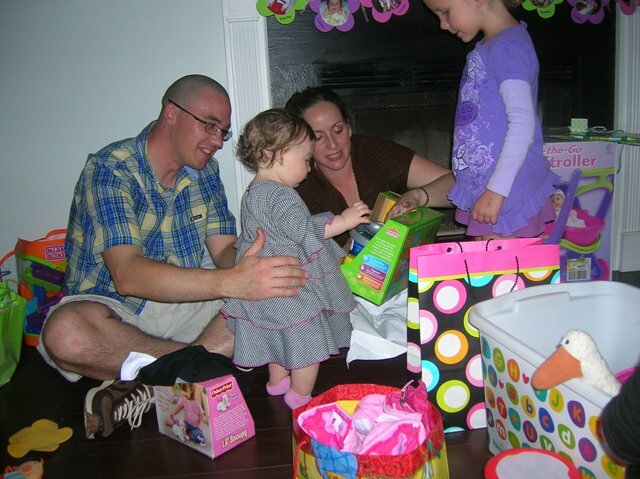 Kris and Tyler showing the birthday girl a present while her cousin Emma looks on. she was assisting in the whole process.. Missing is Laurie..out in Napa with her friends from France and also Matt. Busy day today. Left home early to get to Sweet Home. more about that later..now I must go rest for awhile! 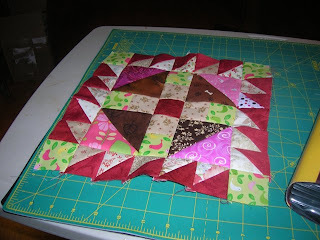 All my quilting buds have been Schnibbling lately and I needed to jump on the bandwagon. The pattern is from Schnibbles Times Two by Carrie Nelson and the pattern is called Imagine. It is made with my new fav..Maison de Garance....gotta luv that French General who ever he is and of course, Moda! I won a giveaway from Nancy of Blogging Near Philadelphia fame and I have incorporated some of the pieces she sent me. If you see Nancy, thank her again for me. I feel the need to make a run to Sweet Home tomorrow. Bad Melisa is having a sale. Gotta check out what is happening. Hope to be there at the same time as some of my Thimble buddies but I need to be there early. Big plans for the afternoon. Birthday party for Sweet Alice. 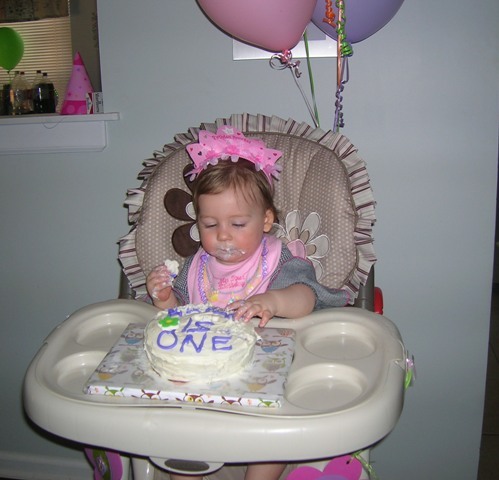 I can't believe she will be a year old on Monday. Relieved to have made it thru another week of MDS assessment insanity..but it does seem to be getting a little smoother. All of my friends know how I feel about applique! There will NEVER be a Baltimore Album quilt in this house. 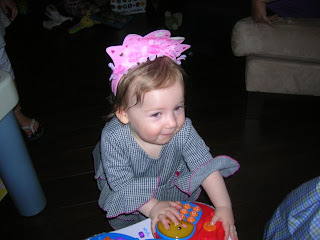 So this month's Groovy Girls included a demo on machine applique. Nope-not gona' do it.....I sat and rolled my eyes. BUT.. Yesterday was Thimbles. I decided with my "support group" close at hand, I would try. And I did it. I thought Pat was going to hyperventilate when I showed her what I had done. The placement was incorrect on the bag and I was not happy with how it looked. But Pat gave me some tips and when I got home I tried again. I will be sending this one up to Kathy in NY. Hope she finds a use for it. First I will take it to Sweet Home and get my card punched! The September block from the Quilt Room BOM gave me a bit of trouble. I kept putting it down because I could not figure out the colors. I finally decided to start at the center and work outward. I finally got it done before the November block is published! 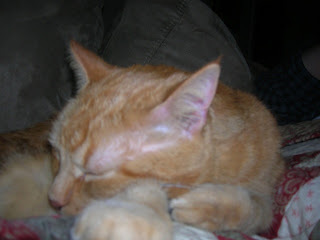 (Notice the toes in the right hand corner-they are in need of a pedi!) Maybe this weekend after THIMBLES!!!!!!!! Maybe getting up early to get to Honda was the reason. When I got back home, I tackled some of the projects on the list that I made while I was sitting at Honda! I finished the owl bag for Alice. Her first birthday is in a couple of weeks. How did that happen already? Also finished the little Halloween bags for the Daisy troop. And I worked on the little quilt top. It just needs it's border on it. 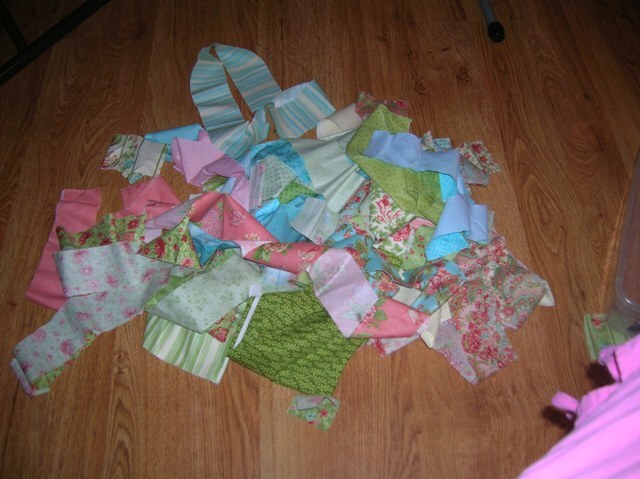 I have no plans for this little quilt but I loved the fabrics! I have some more things on the "to do" list and we'll see what gets done today. The boys enjoyed the open back door yesterday..good bird watching! Houston, I think we have a problem. Pat, Most Exalted Head Thimble noted on a previous blog that she hoped that Moda Man and Fat Quarter would behave this weekend so that I could rest. As you can see, when I checked the love nest, they were no where to be found! OMG..what next?? I blame it all on Fat Quarter. She is a very bad influence on him! 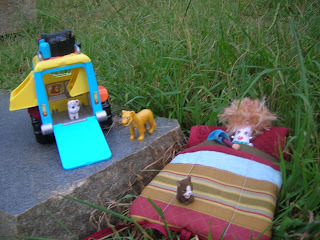 Maybe they are out "camping" again. I will be sewing this weekend-recovering from the week that was. Am I glad it is over. Lots of stuff that needs to be finished. So no new projects. 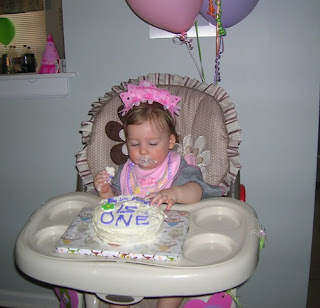 I am working on my project for Alice's first birthday. 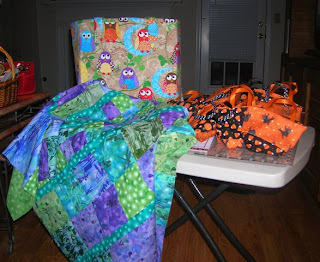 Also have a few more Halloween bags to finish for Emma's daisy troop. First thing tomorrow morning is an appointment at Honda for a recall. Hope it doesn't take too long! Ergo..probably won't get anything done until next weekend. A whole week and no blogging-work got in the way!! Gretchen and Melisa say I can do it. I have a whole month. I did finish the binding on Scrappy scrappy nines last evening. Today I finished sewing the gaggle of geese for Homeward Bound. 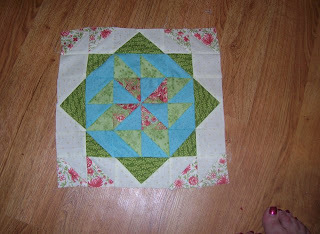 I think this month's Thimbles is a project I have elected not to do (applique)-so I can work on finishing this up then. I am behind on the Quilt Room BOM. so this afternoon, I tackled that project. 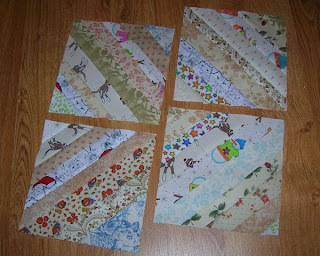 I finished the Oct. block but still have to figure out September-ergo the pile o' strips above. 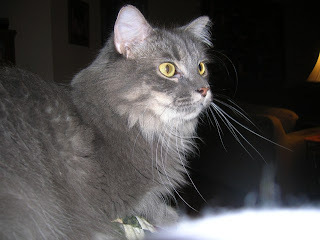 I made a list of my UFOs....it makes me want to escape to the couch! 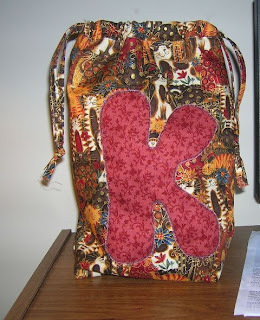 Gretch had a great bag that she made after last month's Groovy Girls. I picked up the pattern and the cardboard on a roll (Cindi's description). I want to make one of those bags. Gretchen is calling it the new Bad Melisa bag. It holds more!!!! I am just worn out from my busy day. The weekend is about half over and I have not done much at all. 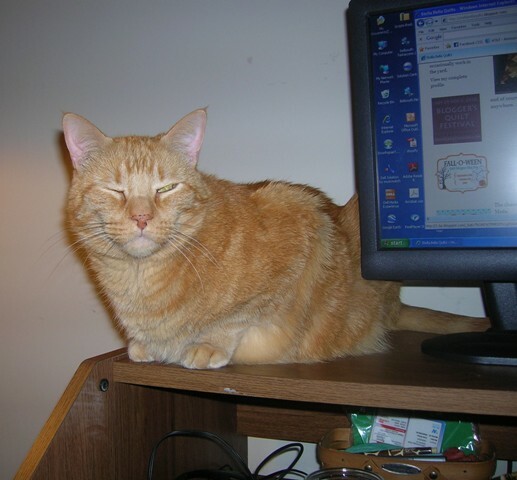 I seem to have contracted some kind of crud-you know: runny nose, cough, etc. And that is my excuse and I am sticking to it! I needed an emergency trip to Little Quilts this morning. I lost my magic wand last weekend. It was such a pretty blue one. Anyway, I don't know of another shop that has them-ergo drive to Marietta. I was there before the shop opened. Also got some "wicky wacky" while I was there. 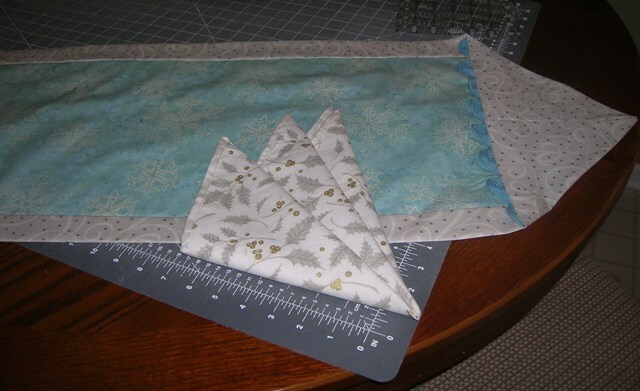 Now I can make the 10 minute table runner. (It will probably take me more like 2 or 3 weeks to get that done). I didn't even hit tiny Stitches on my way back. I went back via Alpharetta to drop off the Halloween pillowcases for Sarah and Emma. 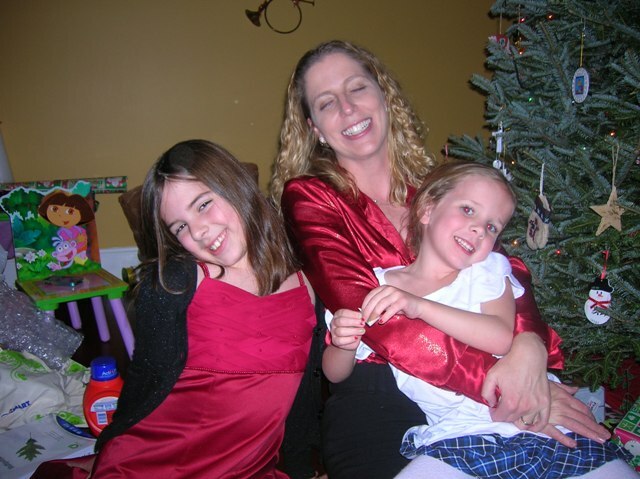 I met them at the soccer field and took Emma to ballet while Sue coached the soccer team. Sue coaching soccer really amuses me. I wish I could have seen it. Rob had to leave at half time. After ballet, we all had lurch together and did a little retail therapy. And then I headed home to the couch. I am wiped out. Hope I feel better tomorrow. I want to play!! First off: there was no ugly. But there was lots of bad!!!! It was Splendor in the grass as you can see. Moda Man took the gang camping. 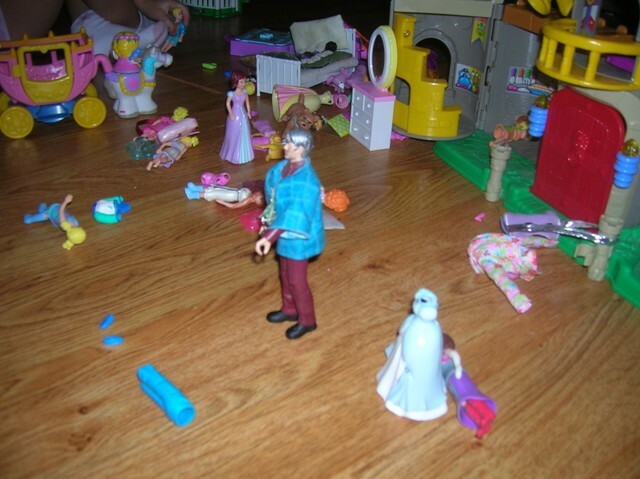 I thought that Bobbin and Thimble were staying home. I guess they decided that they did not want to miss anything. I believe that Moda Man and Fat Quarter had a rather good time. I am not going to tell you what Brenda now has renamed Fat Quarter. So that was the bad of the weekend. 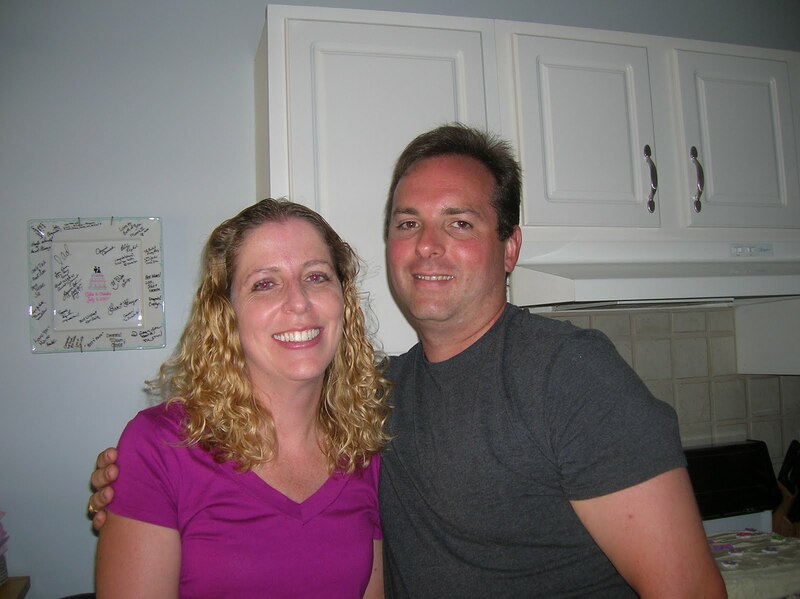 Here is the dynamic duo-Sharon and Shannon. 2 very special ladies that work their tails off to make a wonderful experience for those of us not fooling around in the grass. This year's quilt is really neat. Picture to follow later on-it is not done but it went home with Peggy for a couple of weeks. It will be at Patchwork Cottage. Luv, luv luv the fabric (Moda of course) Thanks to Peggy and Sarah no blog for helping me pick it out. Sharon and Shannon always give out prizes and lots of goodies throughout the weekend. It is a wonder I could get my car loaded because I came home with more stuff than what I went out with. The wrap up this morning was yet more prizes. 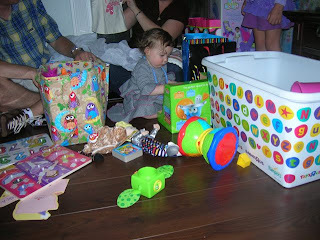 There were 5 really good prizes. I could not believe my luck when Sharon called my number. I WON!!!!!! I never win but I WON!!!!!! You ask: what did I win? I am one happy camper because this is such a special time. I have been 8 years. Cindi, Louise and I are the only ones that have been there since the inaugural Goin' Sewin'. The place is beautiful, the quilters are awesome and we even got French Toast Yes!!! !